What is an All-Inclusive Honeymoon Package? An All-Inclusive honeymoon package is a vacation with accommodations that include all meals and beverages in the room rate. Clients can choose to add on flights, tours, transfers and optional travel insurance to make their itinerary complete. Why should we consider an All-Inclusive Honeymoon Package? These types of vacations are for those who want to know all their expenses ahead of time. When they arrive at the resort, our client won’t have to worry about pulling out their wallet for food and drinks. Super convenient! That way all you must do is lay back, relax and enjoy your time in paradise. 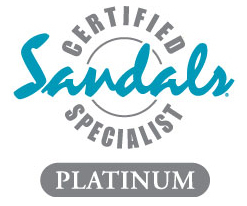 Sandals Resorts are all-inclusive so if you are interested in honeymooning at one of their fabulous resorts we can arrange that for you. All Inclusive of resorts can be found across the Caribbean and Mexico. The only downside to All-Inclusive vacations is they are limited to that area of the world. You can even get a 5 star, extremely luxurious resort. Other amenities like 24 hour room service, non-motorized watersports and entertainment may be included as well, depending on which resort is selected. Sandals Resorts are all-inclusive so if you are interested in honeymooning at one of their fabulous resorts we can arrange that for you. All-Inclusive honeymoons can be luxury, can be taken at a Sandals/Beaches resort and are an awesome decision for starting your lives together. What is normally included in an All-Inclusive Honeymoon? *There are many exciting tours and adventurous excursions to make your honeymoon vacation even more memorable. Don’t picture your honeymoon exactly like this? Our dedicated team at Lisa Hoppe Travel Consulting can find the perfect itinerary for you. We Customize each & every All-Inclusive Honeymoon! Unlike many so-called travel specialists, Lisa Hoppe Travel Consulting ensures that each experience is customized to what you are looking for – within your given budget of course. We’ll ask you questions about what you’re looking for in a resort and find one to suit those needs. Some resorts even feature Club Level categories for enhanced service or suites with your own personal butler. The butler can help you arrange tours, make your dinner reservations, save your favorite chair by the pool or even draw you a romantic bubble bath with rose petals. If you have any special add-ons like excursions or spa services that you’d like to purchase with your resort stay just let us know and they can be added to your package. We make sure your honeymoon is uniquely-tailored to your dreams! If your wedding is less than a year away we can begin planning the honeymoon. It’s best to book sooner rather than later for best pricing and availability. Give us a call at (414) 258-8715 to get started today!